“Small towns have big stories.” That was a lesson Katie’s father taught her years ago. A lesson she’s taken to heart. And right now, Katie is desperate for a big story. Reeling from the recent loss of her father and with her agent breathing down her neck for the next book, the twenty-one-year-old writer picks a spot on the map and finds herself bound for a middle-of-nowhere town called Bishopville, South Carolina. Taking a chance on the words of a local grocer, Katie stumbles upon a rare breed of dogs raised by the town doctor and his nephew Kyle. The only problem? Kyle isn’t interested in telling stories—especially not to a big-city girl who can’t seem to sit still. In an attempt to win him over as the clock winds down, Katie finds herself immersed in Kyle’s world, doing everything but writing. When inspiration finally strikes, Katie is faced with an unforeseen catastrophe and a truth she can no longer ignore. While she has come to love the dogs, the real story may be about Kyle Walker. Katie drew in her breath quickly, but didn't move. His head was huge relative to his body and was lowered, so it was even with his tail. His teeth were not bared, but he was definitely making some sort of growling noise as he stared directly at her. From her knees the dog was almost eye level. She noticed there was no collar around the dog’s neck, unlike Biscuit. And a defined strip of fur down the dog’s back bristled. She wasn't sure if she should back slowly up the steps to the porch, make a run for her car, or just sit there on all fours and not move until Doc returned. Before she could make a decision, a man appeared on the dirt and grass path several hundred feet behind the dog. With the sun at his back she could only see his silhouette, but he appeared to be holding something up to his mouth. From where she was it looked exactly like a person standing with a harmonica—but not quite a harmonica. Something else. A high-pitched whistle lifted over the breeze and ran down towards her. The black dog growled once more, turned, and ran. His gait was smooth and effortless. With long fluid strides his back remained perfectly flat as he moved across the land. When Katie finally took her eyes off the dog and looked back towards where the man had been standing, she saw nothing. A few seconds later, the dog crested the horizon and both of them were gone. Wesley Banks was born in 1983 and grew up on the west coast of Florida. 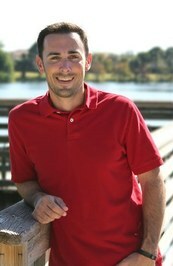 He graduated from the University of Florida with a Bachelor's and Master's degree in Civil Engineering. After spending over 7 years building movable bridges from Florida to Washington he decided to focus on his true passion: writing. Wesley recently moved from Florida to Oregon to get back to the great outdoors that he's love so much. He lives with his wife Lindsey, and his two dogs Linkin and Story. Most of his time these days is spent writing, with as much rock climbing, hiking, or skiing as they can fit in. 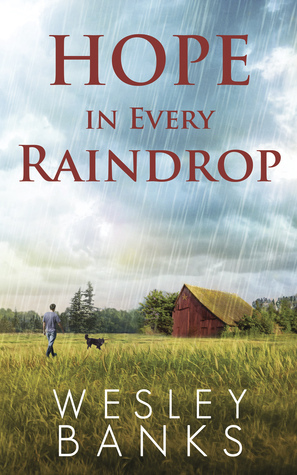 Giveaway for one (1) ebook copy of Hope In Every Raindrop. Open internationally. To enter leave a comment with a way to contact you if you win (email, Twitter handle, etc). Ends June 30th 2015. Author will send prize after July 6th. This post contains affiliate links, to find more click here. I love the sound of this! I'm a sucker for books about small towns and throw in the dogs! I'm sold!